A new study by the Pew Research Center finds Hispanic students outpacing whites in college enrollment rates. Richard Fry, the study’s author, attributes the increase to the economic recession. Fewer job opportunities could be driving more Latino youths to enroll and stay in college, he said. But Fry cautioned that the job market may not be the only reason. What other factors might be at play? One possibility is No Child Left Behind. Fry said the 2001 federal law implemented during the George W. Bush administration not only held schools accountable for raising test scores, it also pushed schools to increase their graduation rates. Another point highlighted in report is the value that Latino families place on education. In a 2009 Pew Hispanic Center survey, 88 percent of Latinos ages 16 and older agreed that a college degree was key to getting ahead – a higher figure than the 74 percent who answered the same way in a separate survey of all Americans that year. “It’s possible that there’s been a rising awareness particularly among Hispanic adults of the importance of a college education and that’s being reflected in the fact of how many high school graduates are actually going on to college,” Fry said. College enrollment rates are not the only numbers in the report drawing attention. 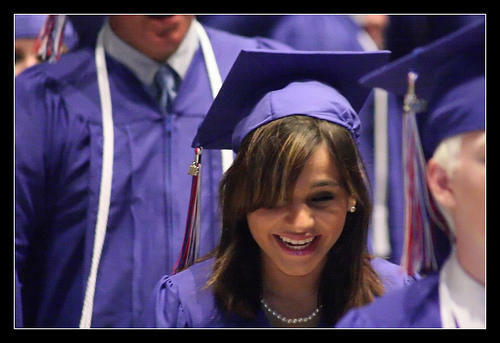 The same analysis found that fewer Latino high school students are dropping out. In 2011, 14 percent of Latino students ages 16 to 24 dropped out compared to 28 percent in 2000. Despite these new numbers, Fry said it’s important to point out areas where Hispanics continue to lag behind white students. They remain less likely to enroll in a four-year college and are less likely to complete a bachelor’s degree. The state’s largest business organization is pushing legislation that will link higher education funding to the number of college students who actually get a diploma. Governor Rick Perry is putting new pressure on universities to contain tuition and graduate more students.